Book Creator is an app with many applications. This post describes the use of Book Creator as an alternative to writing formal lab reports. Here is a quick example example of what a lab report could look like on book creator. You could also do this on Google Slides… This strategy meets the needs of students with LD, and allows teachers and students to document conversations and observations that happen during a lab. Before beginning any activity or lesson in the classroom, I think about the activity through the lens of an English Language learner who might be coming from a very different cultural background. What vocabulary do they need to know? What skills will they need to participate effectively? What safety rules must they know? Once these are identified, I can then determine the best way to communicate these ideas with my students based on their learner profiles. 2. Allow the use of first language in the classroom. 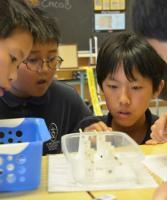 I frequently allow students to discuss science concepts with a peer in first language. While I might not know exactly what they are taking about, it’s easy to tell when students are on topic or off topic (noise level, body language, focus, what they write down, etc.). Students appreciated being able to take a break from thinking and talking in English. It’s exhausting! Allowing the use of first language allows students to grapple with more difficult ideas without the language barrier. It also allows them to make connections to their prior knowledge. 3. Model and use visuals. I do this with all my students, ELL or not. Whenever I introduce an activity with safety concerns, or specific lab instructions that are a little complicated, I model it for my students. 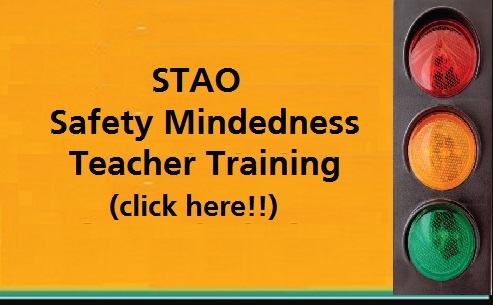 Visuals are also a powerful way of communicating key messages to students. If I am unsure that somebody has got it, I check for understanding by having the students model it back. 4. Create anchor charts/word walls with a combination of visuals, English and First Language. My walls need to be decorated! But seriously, having key words, safety rules, and key concepts posted in a highly visible location is a great support for those students who just need a visual reminder. I invite my students to help create these useful tools and remind them to use the tools regularly. This goes back to planning. I think carefully about the task and what I want the students to get out of it. Is it about understanding the concept, or developing the academic language? I choose group structures that best match the task. If they are grouped together, does each student have a specific role? Which roles will promote English language development in my ELL students? Which roles can they be successful with? 6. Provide sentence/question stems for activities in which students must speak with others. I do this with all my students. I got tired of them asking the same superficial questions and not answering questions properly. Let them focus on the content, not the English grammar. By modelling the way to ask questions and provide information, they pick up the grammar. Depending on the activity, I will provide a script, list of question starters, or list of sentence starters that they must use in their conversations. This helps guide the level of questions I want them to ask, too! Every group of students is different. A strategy that works with one group may be more or less successful with another. For me, that is part of the challenge. How have you met the challenge of ELL students in your classroom? 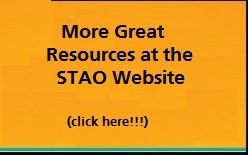 Please share your ideas with the STAO community through the STAOblog or on Twitter at #staoapso .